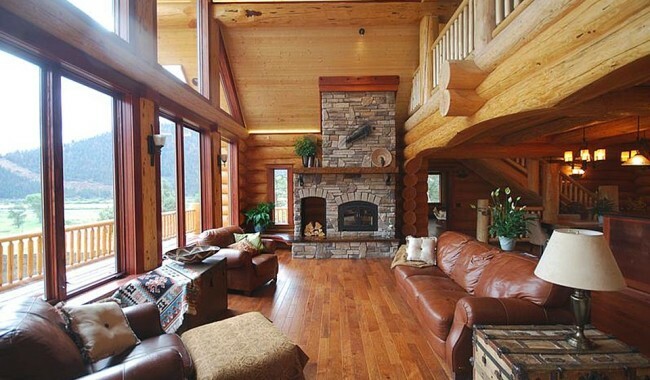 Home / Why We Love Log Homes and Cabins Blog / Waiting For a Log Cabin? Making Your Log Home a Reality! Waiting For a Log Cabin? Making Your Log Home a Reality! You might be closer to moving in than you think! We talk to a lot of people who’d love to live in a log home and their stories have various conclusions. Some end with a happy family and a new log home…but some are more disappointing. After building with logs for nearly 40 years we can share a few points that might help get things rolling smoothly! 1. Talk it over with your wife/husband. Being in love doesn’t automatically mean you’re always on the same page! If one of you wants an industrial modern loft and the other craves a rustic log cabin hideaway you might be looking at some serious compromises. (We can help here, since options like timber-frame, post and beam or log hybrids allow contrasting styles to blend harmoniously) Tackle this subject carefully: a divorce can cost a lot more than a new home! 2. Talk to your bank and get a clear picture of your options. What kind of financing will you need? Being pre-approved helps determine your budget. If it turns out that you’re not quite ready to begin, a financial advisor can help you with a game plan so you’re making the most of your hard earned money. 3. Whether you’re buying land or building on a property you already own, you’ll need to learn about things like “property line set-backs”, building codes, and community regulations such as height restrictions. Sensitive areas might even require environmental or archaeological studies. Be sure to ask your realtor or check with local authorities. 4. Remote rural locations often appeal to log home enthusiasts but basics like access, power, and water can present challenges that affect your budget AND your timeline. You might have to be as stubborn and determined as your pioneer grandparents…are you up for the adventure? 5. Find a log home plan you like. We don’t just build the ones you see on our website so go ahead and send us a link to whatever catches your eye. If you can’t seem to find exactly what you want, we can send you more home ideas or you can sketch it out yourself (graph paper works great) and we’ll have a draftsman turn your ideas into a blueprint for a log home that’s uniquely yours! You can even name it. 6. How many square feet do you actually require? Don’t forget to count your outdoor areas. Decks and porches are relatively inexpensive ways to expand your living space, especially if you’re planning a summer cottage. Numerous log corners and complex roof lines add to the cost while vaulted ceilings, big windows and open floor plans can make a compact space feel much larger. Could you love fall in love with a simple plan if it means you’ll move in years sooner? 7. Honestly assess your needs and wants. Everyone on HGTV seems to have pretty fancy non-negotiables: luxurious master suite, professional appliances, granite counters, wood floors…does that sound like you? Finishing costs can drive up the overall price quickly. Would you be willing to consider a smaller log home if it meant you could include high-end finishes and still stay on budget? Alternatively, you could opt for more modestly priced finishes and get the look for less. Remember: the nicest homes are not necessarily the biggest or the most expensive! 8. Don’t skimp on log quality or craftsmanship: the logs, after all, are what you (and your neighbours) will look at every day! Hand selected, hand peeled, handcrafted log work provided by a reliable log home company that works closely with your contractor is the key combination! You’ll be able to shop locally as you select doors and windows that reflect your taste and support your community by employing local trades. A trusted log home company will be there to help even as the years go by! 9. Don’t be afraid to call or send a message… if you’re not sure where to start, make a list of questions: never be afraid to ask!